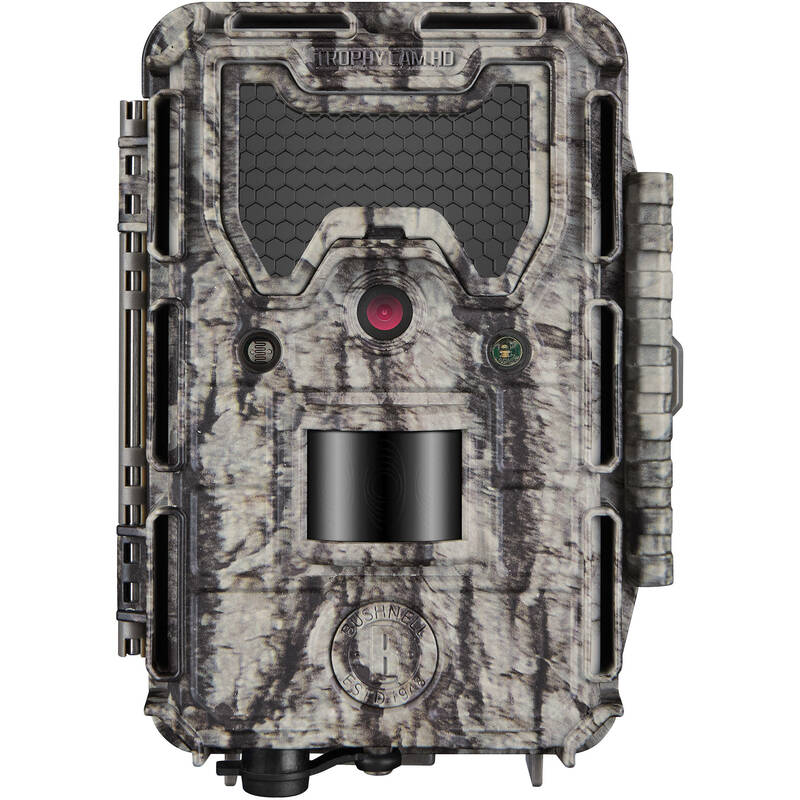 With a 24MP resolution and a quick 0.2-second trigger speed, the camo Trophy Cam HD Aggressor No-Glow Trail Camera from Bushnell offers the ability to capture high-resolution stills or HD video of wildlife and people on your property or hunting grounds. It's equipped with a 2.4" screen for viewing your images and video. The camera's 48 No-Glow LED flash array has a range of 80', but won't spook game or alert an intruder. The shutter is ready for another photo after a recovery time of a half second. A removable anti-reflection LED cover helps to ensure the camera remains unnoticed by reducing reflections on the LED array's protective panel, but it can be removed if you want to boost the flash output a bit. The passive infrared motion sensor has a detection range of 100'. Along with triggered images and videos, the Trophy Cam HD Aggressor includes a reinforced cable lock channel and latch, is weather resistant, and is operable at temperatures from -4 to 140°F. Box Dimensions (LxWxH) 8.8 x 5.8 x 3.4"
Trophy Cam HD Aggressor No-Glow Trail Camera (Camo) is rated 1.2 out of 5 by 6. Rated 2 out of 5 by Michael from Great images except.................................... This cam needs to be reevaluated as there seems to be issues. The unit I received would not set the time and date correctly (updating minutes also updated the year but would not save anyhow). Also, as another reviewer indicated, there is an issue with recording multiple images when set to do so. Only one image recorded though 2 and then 3 were chosen. Image quality was great but cam had too many faults. I did try calling Bushnell but waited way too long several times trying to get through. Fortunately this item was purchased from B&H. Thank you B&H for your return policy. Rated 1 out of 5 by The Insidiator from Does not retain custom settings I am bitterly disappointed by this camera. It worked for about 2 weeks and then began 'forgetting' all of my custom settings. No matter what settings I configure, it resets to default. Field scan with a 15-minute interval? Nope, it resets to Field Scan Off and only triggers when the sensor detects movement. Hybrid (picture & video) mode? Nope, it resets to picture only. 4K resolution for pictures (yes, for pictures, not video)? It resets to HD. 1080p video resolution? It resets to 720. The only thing it DOES remember is the time and date (so there's that). I have no use for a camera that does not retain custom settings. Nothing I do (new batteries, format the memory card) seems to help. Unless I can find some other solution, this is going back and I'll have to think about never buying Bushnell again. Rated 1 out of 5 by Anonymous from Cant believe this is for sale I bought this new one hoping Bushnell fixed there 1080p video and they did make it better but not by much. Others are far better. The picture quality is real good with some issues in the shade with dark pictures. I already sent this one back. The video does not allow you to set the length of the video. You only can do this Dynamic video. So you will mostly get 5 second videos. I have plenty of videos with deer in front of it moving and it cuts off at 5 seconds. I set mine to Hybrid mode to get 3 pictures and then a video. I got nothing but black pictures at night. The videos after the pictures worked properly but my lens in this camera was crooked and one side of the videos was black dark because of the lens being out of align. I also changed out the SD card and the camera went to defalt setting and I had to reset date and time. I viewed 35 videos and 2 had no sound. I set the camera for 3 shot burst and it would only take 1 picture. I called Bushnell and they are working on the issues. Dont get one of these now. Maybe later they will fix the issues and you can buy a decent camera. I have owned many Bushnell cameras in the past. I was just hoping they would have another good one. Rated 1 out of 5 by Souks from All around bad I'm not much of a comment writer but I had to with this camera. It seemed ok at first then just went down hill. First, the 1080p video was blurry on the viewer, which wasn't so bad and they put out firmware to fix that. Second, the clock wouldn't stay set, not sure if it was after taking out batteries or SD card but either way it didn't work. Third, the camera I got had some weird battery issue, killing new batteries. I contacted bushnell and they recommended using lithium batteries which I did, for $20. The camera somehow messed up those batteries too. Don't buy the camera until they get out all the kinks. I will say this, Bushnell customer service was excellent, A+ every time I talked to them, I'd try this camera in the future because of that. Just my two cents. Good hunting! If you steal trail cams grow up, we are all trying to enjoy the outdoors. Rated 1 out of 5 by Richard L. from Not worth it I got this camera from B&H as a backup for another similar Trophy Cam HD purchased a year earlier. I took it out of the box this winter for the first time. Detection does not work. Whatever the sensor level I select, it will take photos and/or videos continuously, filling a 32 GB card in two days and draining $10 worth of batteries. It is out or warranty by a couple of months and totally useless for me now. Over $200 wasted. Very disappointed since my other Bushnell camera works very well. Rated 1 out of 5 by Greg J. from not dependable It may or may not capture the action. Don't buy it.